The Monkey has the ninth position in the Chinese Zodiac. 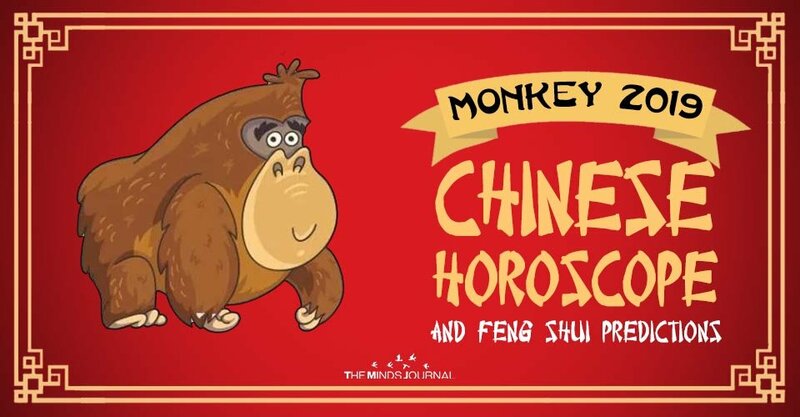 Your “chinese zodiac animal is Monkey” if you are born in of these years: 1932, 1944, 1956, 1968, 1980, 1992, 2004, 2016. The following are the twelve zodiac signs: Rat, Ox, Tiger, Rabbit, Dragon, Snake, Horse, Sheep, Monkey, Rooster, Dog, Pig. During the Year of the Pig 2019 , the concerns related to the financial sector are majorly emphasized in the first part of the year, especially the income obtained through your own work. The 2019 Monkey horoscope predicts that those born under the Monkey zodiac sign are going to have a year focused on spiritual evolution. They need a period of time when they can breathe, probably isolate more than before, and focus on their own peace of mind. Wood Monkey 1944, 2004 Year 2019 can be good for your career,if you use your chances wisely ! Fire Monkey 1956, 2016 2019 is a mixed year that it can bring you great accomplishments ! Metal Monkey 1980 In 2019 important life decisions can be challenging to make ! Earth Monkey 1968 Take care of your health especially in January-February and June-July 2019 ! Water Monkey 1992 2019 you have high aspirations and many plans ! Lunar New Year 2019 comes full of good news! At least for the Monkey natives, who will miss no opportunity to show their talent, ambition, work capacity, and passion! Energy is the word that defines them, and their career is going smoothly. They are protected by the Sun, which means that their finances are going to register great profits. If you don’t have a job, in 2019 you have all the chances to find one that not only it will prove to be a step forward in your career, but it will also be very well remunerated. It is recommended to send your resume to as many companies in your field of interest as possible, to get ready thoroughly for interviews and to negotiate as best as you can your salary. It is possible to benefit from several sources of income because, besides your job, you could open up a small business. Even so, it is not advisable to throw money left and right. Wait for the end of the year to start making investments such as house renovation or a new car, especially if a credit is required. The Monkey native is sensitive and full of life. The Monkey gets involved in a relationship but gets bored quickly. In 2019, the Rat or the Dragon are the ideal partners for the Monkey; they are attracted to each other in an irresistible manner. The Monkey-Tiger union will bring only fights and misery, so it should be avoided. Because the Monkey and the Rat think alike and have the same beliefs, there is an irresistible attraction between them, but they must work diligently in order to be able to spend a lifetime together. For the natives that are already involved in a relationship, this is a good year for marriage, while for the single natives, it is an ideal year to find a life partner. In love, the end of 2019 is one full of adventures. The single Monkey natives can thus enjoy a few short flings, but if they want a serious relationship, they must wait. Those married could see their marriage in danger, because of their tendency to cheat. They need to control their urges and, at the same time, to watch out so that their partners remain faithful. Although problems might occur despite all the precautions taken, you must know that your friends will stay close to you and will help you overcome the difficult moments. In 2019, the Monkey natives are almost completely committed to their love partners, they are very caring but, at the same time, they maintain a certain distance and awareness of their own needs. Put differently, even if they love with all their heart, the Monkey natives need to feel that they are loved and that their spiritual needs are satisfied in the same way they commit themselves to their partners. Otherwise, they get frustrated and let go of the relationship. They need a stable partner, who focuses on both the emotional and the physical side of their relationships. And last but not least, they need someone who can ensure their emotional wellbeing, instilling in the same time their interest in the relationship itself. The Monkey natives are usually healthy people, always ready to conquer the world. The Monkey feels the need to find inner peace in 2019. Activities such as meditations, tai chi or yoga will help them relax and gain physical strength. The Monkey natives are not lacking luck in terms of health either, because they will encounter no issues. On the contrary, they will be full of vitality, and if they intended to start doing sports, 2019 is the perfect year for it! Only towards the end of 2019, your health could give you some trouble. If you are old, you should visit the doctor regularly, especially in the first part of the year and especially if you suffer from chronical affections. If you are young, be careful about your diet and don’t let a week pass by without doing sport. February and August are the months that can pose the greatest health risks. Money : A fitting remedy for those born under the Monkey sign is a figurine with the 8 Immortals. The Eight Immortals described as sitting and resting under a tree – a Feng Shui remedy truly beautiful, made with special attention to details. The legend claims that the Eight Immortals were sent from the heavens to assist and guide us in pursuing our goals and ambitions. By having the Eight Immortals under a tree at the office or at home, you will ensure their support in everything you are trying you accomplish. The Eight Immortals are superior beings, worshipped by Taoists and considered to be symbols of longevity and luck in Feng Shui studies. Consisting of six men and two women, the legend says that they were sent from the heavens to help people in their ambition and aspiration to win wealth, fame, health, and knowledge. Each Immortal has an instrument with supernatural magic powers. The symbolic presence of the Eight Immortals in your house will ensure health, happiness, and luck for each member of your family, especially during this period – the period of 8. A Feng Shui remedy for wellbeing and health is the Toad with three legs on coins and Wu Lou. The Money Toad, also known as the “Toad with Three Legs” or “Chan Chu”, is probably the most powerful symbol of prosperity. In ancient times, the Wu Lou was used to store water or potions used during travels and expeditions. Because of Wu Lou’s role of keeping alive the travelers, it received the name of “life-giver” and thus, it became a strong symbol of good health. Also, it is believed that the Wu Lou contains an elixir for health, vitality, and immortality. In Chinese mythology, the Wu Lou is often used by the Taoist monks to attract and capture the evil spirits inside. Therefore, the Wu Lou is a powerful Feng Shui remedy for absorbing the negative energy surrounding us.